Two godly brothers who personify the DC and Marvel Universes become aware of the other's existence, and challenge one another to a series of duels involving each universe's respective superheroes. The losing universe would cease to exist. The story had an "out of universe" component in that, although there were eleven primary battles, five outcomes were determined by fan vote. Aquaman (DC) vs. Namor (Marvel). Aquaman won by crushing Namor with a whale. Elektra (Marvel) vs. Catwoman (DC). Elektra won by making Catwoman fall off a building. Robin (DC) vs. Jubilee (Marvel). Robin (Tim Drake) won by using his cape as a decoy and then by tying up Jubilee. Thor (Marvel) vs. Captain Marvel (DC). Thor won when Captain Marvel was forced to change back to his alter ego Billy. Billy tried to change back but Thor exerted control over him using the magic lightning and the resulting blow caused his hammer to fly off and Billy to fall unconscious. Superman (DC) vs. Hulk (Marvel). Superman wins in an all out brawl. Spider-Man (Marvel) vs. Superboy (DC). Spider-Man wins by electrocuting Superboy. Batman (DC) vs. Captain America (Marvel). Batman won by knocking Captain America out with his batarang. Initially both are evenly matched but then a sudden wave of water (their battle takes place in a sewer) knocks (Captain America ) off balance as the both throw their weapons. Batman's batarang strikes Cap's forehead, but Cap's shield misses. Wolverine (Marvel) vs. Lobo (DC). Wolverine beats Lobo in a brutal barfight which was largely off panel. Storm (Marvel Comics) (Marvel) vs. Wonder Woman (DC). Storm won the fight after repeatedly hitting Diana with her lightning after a brief melee encounter. However it should be noted that + Wonder Woman threw away Thor's hammer prior to the fight in order to have a clean fight. I just so happen to have a bundle of those comics' collector editions. You can buy the bundle here. Marvel attained six straight victories in the preliminary battles and five battles were decided by fan vote, of which Marvel came out ahead with a straight win again. Several smaller, story-driven fights occur throughout the series, none effecting the outcome. The series plot does not show one side as being victorious. 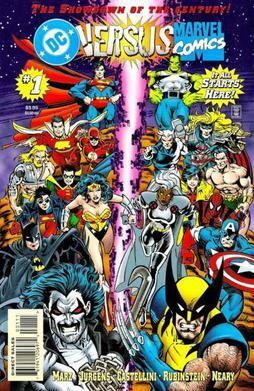 As part of a last-ditch effort to save their worlds, the Spectre and the Living Tribunal were able to briefly force the "brothers" to resolve the situation by temporarily creating a new universe, called the Amalgam Universe, which is occupied by merged versions of many of the heroes (such as Dark Claw, a merging of the characters Batman and Wolverine). An inter-dimensional character called Access eventually managed to restore the universes to their normal state with the aid of Batman and Captain America. The presence of the two heroes (essentially serving as the brothers in miniature, each being unique among their peers) forced the brothers to recognize how petty their disagreement truly was. Although a victorious universe is never specifically acknowledged within the story, Marvel Comics celebrated the result by publishing a one page advert in some of their comics. The promotion featured the winning Marvel heroes: Thor, Silver Surfer, Elektra, Storm, Wolverine and Spider-man. The series was collected into a trade paperback titled DC versus Marvel Comics (collects mini-series and Doctor Strangefate #1; 163 pages; September 1996; ISBN 1-56389-294-4). Two versions of this paperback exist with one edition having DC winning three of the five fan voted battles and another version of the trade paperback with Marvel winning three of the fan voted battles. In both editions only Superboy and Lobo lose their respective bouts. See full Wikipedia article for references.